Scott Travers grew up on Long Beach Island, New Jersey. His interests span the fundamental themes of evolution, ecology, and conservation, which he studies through collections-based fieldwork on tropical amphibians and reptiles. He obtained a bachelor’s degree from the University of Florida and a master’s degree from Villanova University. As an undergraduate he conducted herpetological research projects in Central America and southern Africa. 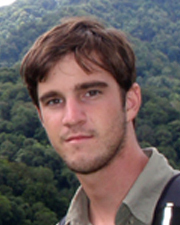 His research in Africa drew him to work with Aaron Bauer at Villanova for his master’s, where he studied biogeography, species limits, and diversification of African dwarf geckos (Lygodactylus), focusing primarily on savanna and Afromontane radiation. While Scott maintains an interest in Africa and the Neotropic, at the University of Kansas his doctoral research focus has shifted to Southeast Asian and Southwest Pacific herpetofauna. For his dissertation, he has been integrating genomic datasets and phylogenetic/phylogeographic approaches to deimit species boundaries and explore patterns of lineage and morphological diversification, and community assembly throughout this diverse region. Over the past year he has conducted fieldwork in the Philippines and Java, Indonesia and been working on next-gen sequencing of ultraconserved elements (UCE) to delimit species within several recent, rapid radiation of Philippines lizards (Varanus and Gekko).